This Halloween Charades Costume Edition game adds a twist to the popular charades game. What would a Halloween party be without fabulous costumes and fun games, right?! These fun Halloween Charades Costume Edition mixes both costumes and games into one fun package. This charades game is a little different than the usual charades game. Instead of just acting out charades, teams will break into smaller groups of 2 and will pick one of these fun charades ideas out of a pail. They will then have a short amount of time (say 1 – 2 minutes) to create a Halloween costume to help the rest of their team members guess the right answer. For example, let’s say you have 2 teams of 5 people – Team A and Team B. Team A chooses 2 players from their team to pull a charade out of the pail. Let’s say these 2 people pull “Witch Riding a Broom” as the charade. They then grab their box of costume supplies (I’ll provide ideas for these supplies further down in this post) and will go into a separate room where they’ll have a specified amount of time to dress one of the 2 of them into a witch costume. After the timer rings, these 2 people then come back into the playing area to reveal their costume. Team A (the remaining 3 players) would get 1 guess as to what the charade is simply based on the costume. If they get it right – they get 2 points (1 for guessing the right answer and a bonus for guessing it before the charade begins). If their guess is incorrect, then the player starts acting out the charade. The team members from Team A who have not seen the answer begin to guess. If they guess the right answer before the timer sounds – great! The team gets 1 point. If they don’t guess, Team B gets 1 guess at the right answer. 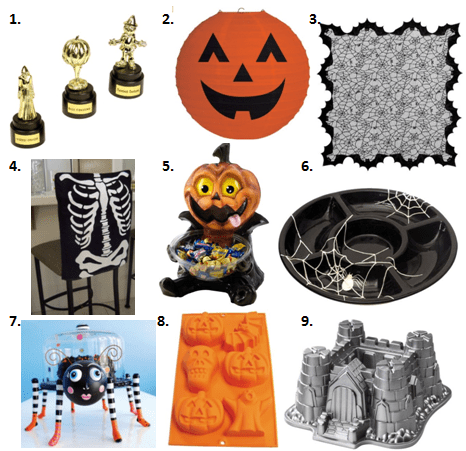 Click here for the free printable Halloween Charades – Costume Edition game. Do you have a costume planned for this year? Looking for more fun & free Halloween games? Visit our Holiday Fun page and scroll down to the Halloween section. Don’t miss an update by following along on Facebook, Twitter, Pinterest and Bloglovin’. *Digital paper design by Pixel Paper Prints. This would be fun for my Cub Scouts! I loved the added costume part..they are a creative bunch (3rd graders)! A Cub Scouts Halloween would be so much fun! I love the creativity that children come up with! what a great idea! love it for family parties. What a creative idea for fall fun! Thanks so much for sharing it at After School. I love the list. It will work perfect for our Halloween Game Night as part of our Halloween Countdown! Can’t wait! Feel free to check it out. Thank you so much for sharing!